Sometimes, tools are the key for satisfying results. The top hardware stores in Hyderabad will provide you with the best quality hardware fittings. 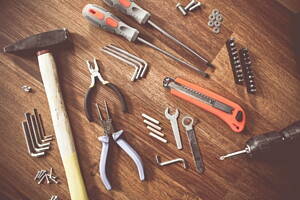 You could find from carpenter tools and cutting tools to door handles or garden hand tools. The first thing you need to do when you’ve decided to carry out your home improvement project is checking what hardware items and other materials you need to purchase. Try to find a store where personal advice is offered, mainly if it is the first time you do something like this. Pay attention to the reliability of the customer service and whether they are experts and really know about what they are talking about. Have a look to the different departments and check which store has better quality tools and compare prices. Bear in mind the location, how close it is to yours. Among all hardware items, we’ve written down the basic ones you will need to prepare your toolbox. Claw hammer to drive in and lever out nails. A wrench which is adjustable to different sizes. A combination pliers for different types of nails. A utility knife for cutting with precision. Different types and sizes of nails and screws. At Infoisinfo we always work hard to be able to show you where to purchase or hire the best products and services for you and your company in Hyderabad. This time, we would like to help you to find quality tools and all hardware items you might need. For this reason, we’ve prepared a list of the best hardware stores in Hyderabad where you could buy hand and power tools. Contact details such as phone numbers, address, websites and opening times are provided. In addition, you can have a look at comments and valuations from other buyers to get a better idea about the quality of the products. If you find it useful, please do not hesitate to share your opinion too so it can help other. Enjoy shopping at the nearest hardware store. MB-6, Tayyab Complex, Saddar. Hyderabad. Sindh. Company is working in Information technology, Hardware Stores business activities. ABLE COMPUTER SYSTEMS is located in Hyderabad, Pakistan. Shop-404, Saddar Bohri Bazar. Hyderabad. Sindh. Opp. HBL, Phuleli Bazar. Hyderabad. Sindh. NOORANI HARDWARE ELECTRIC & PAINT STORE is located in Hyderabad, Pakistan. If you have any questions, please contact us. Company is working in Hardware Stores business activities. MB-44, Tayyab Complex, Cantt. Hyderabad. Sindh. INNOVATIVE COMPUTER SYSTEMS is located in Hyderabad, Pakistan. If you have any questions, please contact us. Company is working in Hardware Stores business activities. Plot #A-51/B, S.I.T.E. Hyderabad. Sindh. Our main activities are computer and office. We work in these areas: computer and computer hardware. Computer and computer hardware are the main activities of this business. Near Haji Shah Chowk, Saddar. Hyderabad. Sindh. Our main activities are adhesive and paints. Categories related to our business: bearing and machine tools. 254/C, Block-D, Latifabad No.6. Hyderabad. Sindh. Timber Market, Doomanwah Road. Hyderabad. Sindh. Masan Road (). Hyderabad. Sindh. Our main categories are hardware and nail.